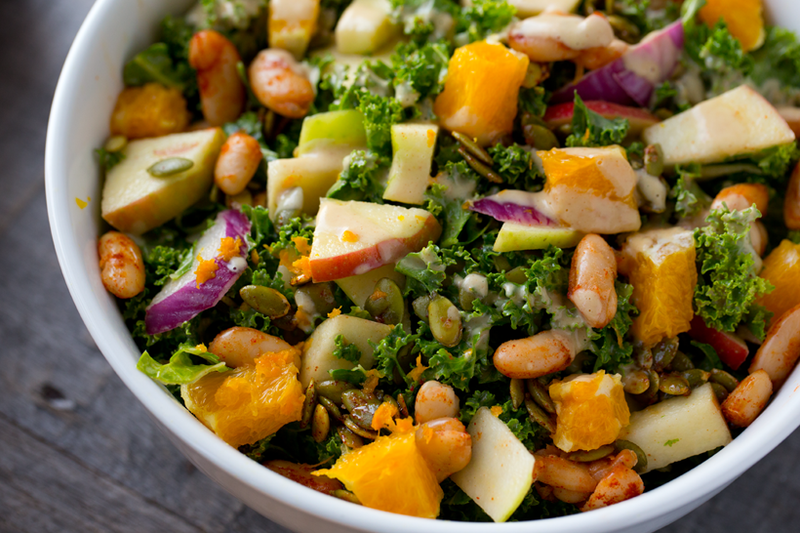 Raw Kale Salad: Fall Edition! Apples, Citrus, Pumpkin Seeds, Smoky-Sweet Flavors. I watched Willy Wonka and the Chocolate Factory while curled up in bed two nights ago. Chamomile-mint tea in hand. I giggled. Smiled. Shouted, "I love this part!" And basically wrapped myself in a warm blanket of memories before dozing off to sleep. More on that in a bit. Because first, this salad..
One of my fave go-to recipes is my Five-Step Raw Kale Salad with avocado, carrots and flavor-infused kale. So last night I whipped up another raw kale salad, but this time with some fall appeal. 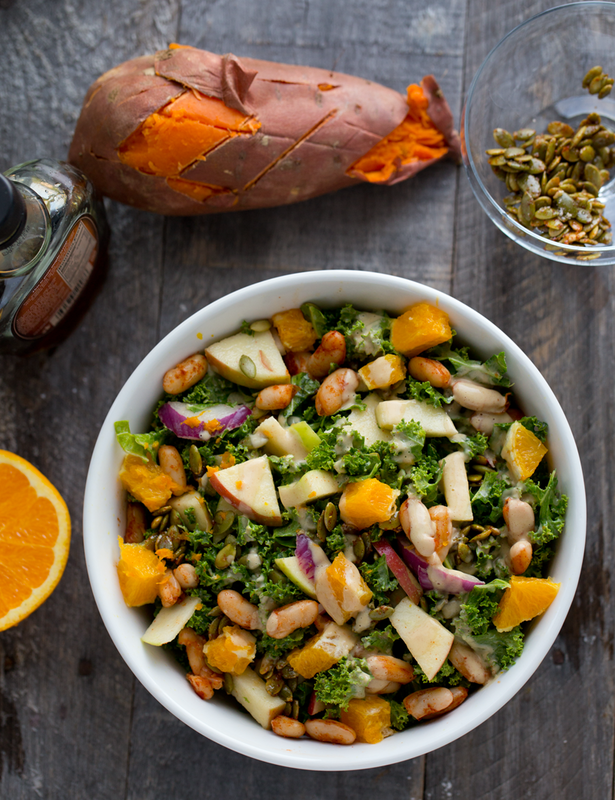 My fall edition Six-Step Raw Kale Salad has crisp apples, sweet citrus, candied pumpkin seeds, smoky-sweet skillet beans, a hint of onion and garlic and a peanutty dressing. I love this salad served with a sticky-sweet oven-baked sweet potato and some gluten-free toast. Hope you love it!.. Love these pumpkin seeds.. they are yummy as a snack too! Social Crash. I have been kinda quiet on Instagram and Snap lately. We are busy prepping to move this week (not far, still in LA!) - and when I get busy, keeping up with social media starts to feel overwhelming. Social media is bursting at the seams with stories, photos, insights and epiphanies. And its amazing! From Facebook Live to Instagram Stories and everything in between, there are so many ways to connect online. I love it. BUT. I hate it. You feel me? It is wonderful, but also exhausting. So trying to fend off social burn-out, a full on social crash where you start deleting accounts and throwing your hands up into the air, cell phone crashing on the floor, I just choose to pause a bit. Pausing, stepping out and coming back is a great way to refresh yourself with most anything. Another tip is to find your little cozy corners online and stick to those places. Filter. Unfollow. Prioritize. It is impossible to keep up with everything and everyone, so finding your own little happy corners on the web and social media is a balanced and satisfying way to go. So thank you for adding this blog to your cozy corner. I love crafting recipes and posts that inspire, teach and hopefully make you feel something. Joy, silliness, hope, hunger, comfort, warmth or calm. I really truly want to bring those positive and nurturing things to you guys. Gene Wilder. And speaking of voices.. I was reminded, just a few days ago, how just ONE PERSON can cut through all the loud voices in the media and online, and truly TOUCH someone's life. The person that made me think of all this was Gene Wilder. I started crying when I heard he had passed. I was in the middle of a call and glanced at the news on Twitter and had to keep talking like a normal person whil tiny tears popped out of my eyes and rolled down my cheeks. I wasn't balling or anything, just filled with emotion. It kinda surprised me. Why was I being so emotional about a guy who I haven't really seen anywhere in years and never actually met? That night I curled up early in bed and watched Willy Wonka and the Chocolate Factory. It never fails to fill me with warmth and comfort. Which is why I can watch it again and again and again ... sometimes skipping through the "Cheer up Charlie" song though. I mean, it's kinda slow. But anyways. So. One person, One space. One movie. One recipe. One blogpost. With SO MUCH chatter going on, it is so important to remember the power of a single thing. Cling to those things that move and warm your soul and you are going to be ok in the end. I promise. Another reason Gene's passing touched me is because he was born in the same year as my dad, who also passed away this year, at the same age. So that little piece really hit me with some emotion. Willy Wonka was always a character I adored - and Gene Wilder made him - and I think now, looking back, it was because he reminded me of my dad in a weird, obtuse way. So anywaysssss. 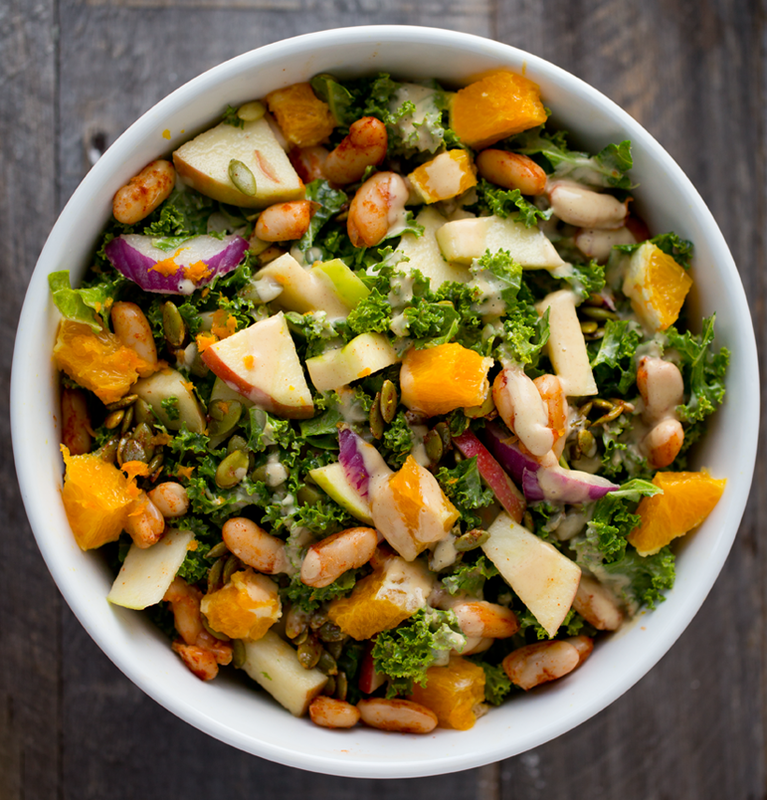 Back to this recipe..
Fall is coming, and this yummy salad will bring you some deliciousness and loads of nutrients. Fiber, iron, vitamins and minerals, phytochemicals and loads of flavor. I love the smoky-sweet flavors in this salad. Smoky paprika and maple and sweet apples and citrus. Loved it!.. 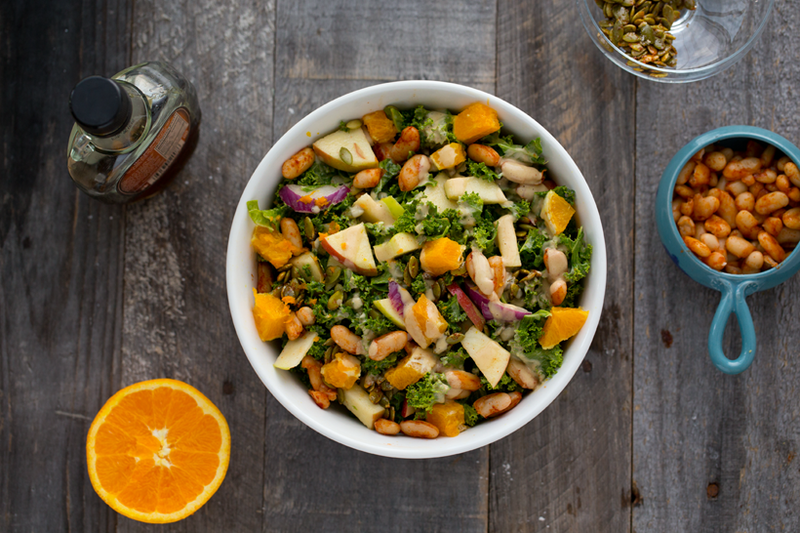 This easy, flavorful fall salad is jam-packed with healthy delicious things like candied pumpkin seeds, crisp apples and sweet oranges. Whip up the dressing by blending all the ingredients in your blender until creamy and smooth. Set aside. Prep your kale! Remove the thick veins/stems and place all the curly leaves in a large mixing bowl. Rinse well - I like to use a fruit and veggie wash. Drain water well. Pat and squeeze kale dry with a few paper towels and be sure to drain any excess water from the mixing bowl. Tear or chop kale into bite sized pieces - I use culinary scissors to further cut up the kale into smaller pieces. Add about 1/4 cup of the dressing to the kale and start tossing! You want to really marinate the leaves with dressing. You can customize how saturated you want your kale to be. More dressing means more flavor and moisture and tenderness. In my photos here, I went with very light dressing. but then added a few more drizzles upon serving. 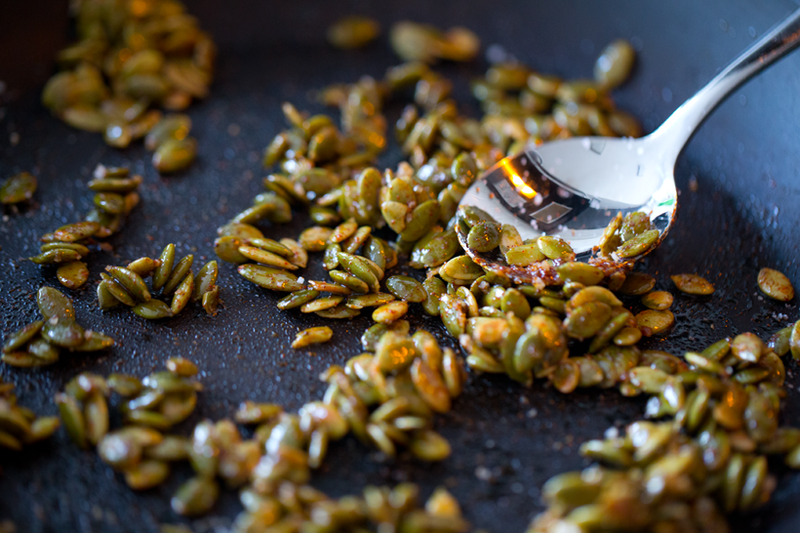 Pumpkin Seeds: Warm a skillet over high heat and add the raw pumpkin seeds. Toast for 1-2 minutes, then add the paprika and maple and toss with seeds. Turn off heat and allow the heat from the pan to caramelize the maple. Break up any large clumps. Sprinkle the salt over top and remove seeds from pan. Set aside. Beans: In the same skillet as the pumpkin seeds, add your drained and rinsed beans. Sprinkle paprika over top and add the maple syrup. Optional: add 1 tsp extra virgin olive oil to the pan if desired for beans with a bit more texture and richness. Saute for 2-3 minutes, just until warmed and lightly browned. Toss! 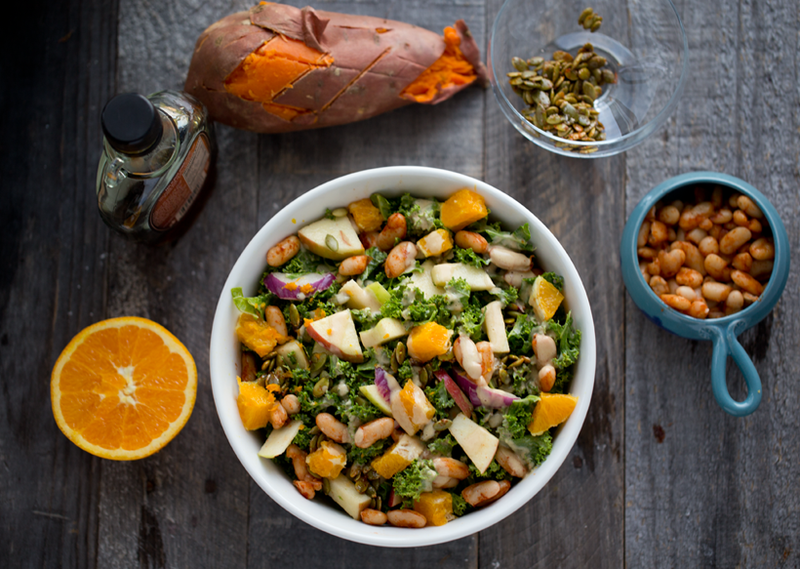 Add all the ingredients to the dressed kale bowl: onion, orange, thinly shaved garlic, beans and a few of the pumpkin seeds. (I like to add most of the pumpkin seeds right on top of the salad so they stay nice and crisp. Toss well and serve in large bowls. Top salads with additional candied pumpkin seeds. Optional: microplane some orange zest right on top of the serving bowls for extra citrus-y aroma. On the side: I love to serve this salad with an oven-baked sweet potato. And a slice of gluten-free toast with Vegenaise. You can add the sweet potato right on top of the salad or eat it on the side. ps. If there is ever anything that you LOVE here in my world, please pop a little comment in one of my posts and I will see it -- and try to do more of that. I love to hear what you guys love. What moves you.